With the new album out, the upcoming tour, the possibility of another new album this year and Paul McGuinness single handedly saving the record industry from pirates (*cough*) what you really need is two guys named Christopher telling you their thoughts on what’s going on in the world of U2. U2log.com has got it’s own podcast, http://u2log.lemonproductions.ca, hosted by myself and Christopher, two guys with faces made for podcasting. Episode 1 is up and ready for your consumption. It goes best with a pint of your favorite beverage. Peter Gabriel is the recipient of the Amnesty International ‘Ambassador of Conscience Award’ 2008, Art for Amnesty has announced. The award will be presented to him by The Edge at a the Hard Rock Cafe in London, on September 10th, 2008. The Ambassador of Conscience Award recognises exceptional individual leadership and witness in the fight to protect and promote human rights. In 2005, U2 and Paul McGuinness were the recipients of the award. It’s a fun packed week for Edge as the Davis Guggenheim documentary ‘It Might Get Loud‘ in which he’s featured alongside Jimmy Page and Jack White will officially premiere at the Toronto Film festival this Friday, September 5th. Got questions about The Joshua Tree? Paul McGuinness will try to answer them on Phantom 105.2 Irish radio, during a two-hours Album Archive special on Sunday December 9th at 10:00pm GMT. Paul McGuinness, The Edge and Bono talk to RTE’s Gerry Ryan from a parking lot in Santa Monica, after their five Grammy win. We’d say that was a pretty good year too, full of many numbers. 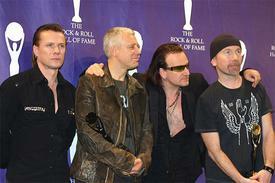 U2 and their manager Paul McGuinness have been named ‘2005 Ambassadors of Conscience’, an Amnesty International Award. The band were lauded for their promotion of the Universal Declaration of Human Rights during the shows on their current Vertigo World Tour. Amnesty International’s “Ambassador of Conscience” Award recognises exceptional individual leadership and witness in the fight to protect and promote human rights. Past winners include Vaclav Havel and former UN High Commissioner for Human Rights Mary Robinson. Support Amnesty. Make some noise. U2 were surrounded by the people who have been instrumental in their career as they were inducted into the Rock and Roll Hall of Fame this week. Among those supporting the band as they were ushered into the prestigious music organization were the band’s wives; manager Paul McGuinness with his wife Kathy Gilfinnan; many from Principle Management’s team (both past and present), including Keryn Kaplan and Ellen Darst; “band consultant” and friend Gavin Friday; producer Steve Lillywhite; concert promoter Barry Fey; sound engineer Joe O’Herlihy; and Until the End of the World author Bill Flannagan. U2 owned the night, even though it wasn’t solely their party. Also inducted into the Rock and Rock Hall of Fame with U2 were Percy Sledge, The O’Jays, Buddy Guy, and The Pretenders. Sire Records exec Seymour Stein and talent agent Frank Barsalona were honored with the lifetime achievement award in the non-performer category. In rebel style, U2 played by their own rules for the entire induction ceremony. They skipped the red carpet arrivals, disappointing the paparrazi and mob of fans who hoped to catch a glimpse of them. (They had arrived at New York City’s Waldorf-Astoria, where the event was held, earlier in the day to rehearse and avoided the arrival hoopla.) Instead of playing the three songs they were scheduled to perform, they threw in a fourth — and, as usual, Bono couldn’t be contained on stage while they performed. Bono, Ali Hewson, Adam Clayton, The Edge, Paul McGuinness and Gavin Friday attended the opening of an exhibition of work by the painter Derek ‘Guggi’ Rowan, at the Osborne Samuel Gallery in London tonight. Bono introduced his friend’s paintings to the guests, including Maurice Saatchi, brother of art mogul Charles. Last night in Dublin, Bono opened a new exhibition of Italian artist Francesco Clemente’s work at the Irish Museum of Modern Art. Bono agreed to open the exhibition because he is a major fan of Clemente’s work, possessing several of the artist’s paintings in his home. Attending the event were friends Gavin Friday, Guggi, and Paul McGuinness. Photos at ShowBiz Ireland and Recirca.com.